The Jamaica Defence Force has made a very good start to the Jamaica Cricket Association (JCA) 2015 Junior Cup Competition, winning the two matches they have played thus far. The team bowled off their season on March 8, 2015 at home, with a 4-wicket victory over nearby neighbours MICO Teacher’s College. Put in to bat, the Cross Roads institution was bundled out for 116 runs. Privates O. Williams, (2JR) and R. Bennett (1ER) were the main destroyers taking 3 wickets for 8 runs and 2 wickets for 15 runs respectively. The other wickets were shared amongst the other bowlers. 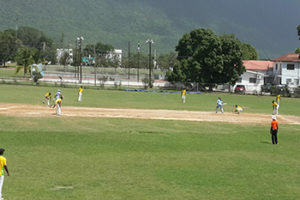 In response, the JDF racked up 117 runs losing 6 wickets in reply. Private S. Bennett, Private O. Seivewright, both from 3JR (NR) were the main contributors to the chase. They made 42 and 23 runs respectively. In the second match, the team turned their focus on our brothers in arms, the JCF. This time the team travelled to Elleston Road to play as guests on March 15, 2015. The Police were first to take to the crease and amassed a total of 145 runs All Out. Private I. Johnson, (1ER) was the ultimate destroyer taking 7 wickets for a paltry 19 runs. He was ably supported by his skipper, LCpl G. Palmer (1JR) who took 2 wickets for 34 runs. In reply the JDF made 148 runs losing 6 wickets. Cpl K. Ledgister (2JR), was the main man at the crease, amassing 43 runs. Private S. Bennett, 31 runs and Private O Seivewright, 29 runs chipped in once again to overhaul the total giving the team another 4 wicket win. The team will place their 100% win record on the line when they next face GC Foster College. The matched is scheduled for 22 Mar 15 at Up Park Camp. We wish them all the best..